An enormous 3-D printer capable of producing entire houses out of clay could help combat the world's swelling affordable housing crisis. 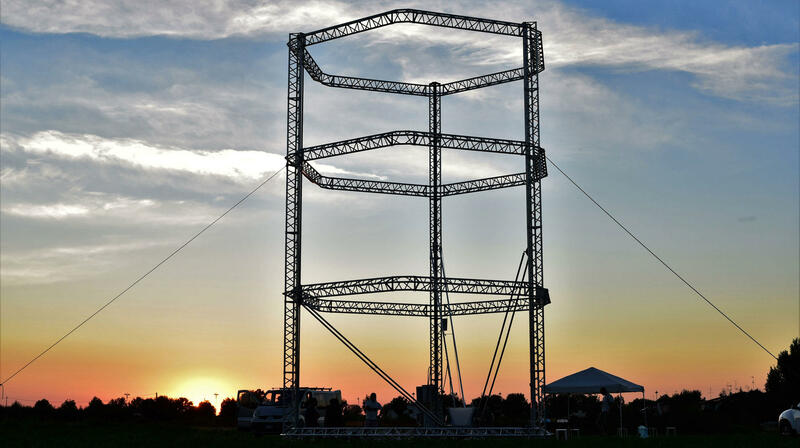 Nicknamed BigDelta, the 40-foot-tall printer is a product of World Advanced Saving Project (WASP), an Italian company founded on principles of sustainability and accessibility. The device is designed for use in areas without modern infrastructure: it harvests raw materials from the surrounding area to construct "zero-mile homes" with low environmental impact. BigDelta could also be rolled out to areas ravaged by natural disasters to aid in the rebuilding process. "Earth is available everywhere in the world; it is cheap and easily malleable. Combined with other 'zero-mile' local materials, clay can create printed buildings that last in time, that adapt to the territory and that do not leave ruins behind once no longer used," the company writes on its website. The need for low-cost housing is alarming, and rises with each passing day. According to Habitat for Humanity, 1.6 billion people across the globe presently live in substandard housing, and 4 billion people will need access to affordable housing over the next 15 years. To meet that demand, nearly 100,000 housing units will have to be built daily. Helping to satisfy that skyrocketing demand is one of the ways in which WASP creator Massimo Moretti hopes to leave his mark on the world. "We demonstrated that ours was not just a dream, that low cost housing is possible and that houses can be built with a 3-D printer. And we also developed a model for sustainability," Moretti remarked in a news release.